Day starts very early. Leave the bed around 3:45 AM to enjoy a drive up the Tiger Hill for having a memorable sunrise view (subject to clear weather), 11 km away from the city. 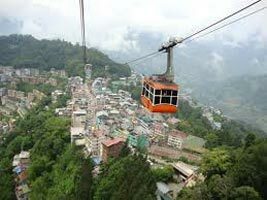 On returning back, explore the other attractions of Darjeeling including Ghoom Monastery, War Memorial and Batasia Loop. Once at the hotel have breakfast. After breakfast, begin the second leg of your sightseeing that take you to Padmaja Naidu Zoological Park, Himalayan Mountaineering Institute (Closed on Thursday), Rope way, Tibetan Refugee Self Help Center (Closed on Sunday), Tea Estate, Natural History Museum (Sunday Closed) and Peace Pagoda. Sunrise view at the Tiger Hill over the Khangchendzonga Peak is a must if you are on your tour to Darjeeling. When the sun rays of the rising sun radiate its light on the Peak, it forms a stunning view for the on-looker. The sun rising from behind the hill looks like an orange ball. 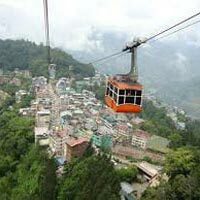 The lofty Tiger hill stands amid dense oak forests and the road route from the city to the hill is very refreshing during the wee hours of the morning. The day is scheduled for full day sightseeing post breakfast. Visit the main attractions of Pelling Rimbi waterfalls (12 km) - a nice place to indulge in activities like swimming and fishing, Rimbi Rock Garden- a picnic spot with recreation amenities and a nice set-up, Khecheopalri Lake- a holy Buddhist lake known to fulfill people’s wishes, Rabdantse ruins- the views from of the Khangchendzonga ranges are mesmerizing.